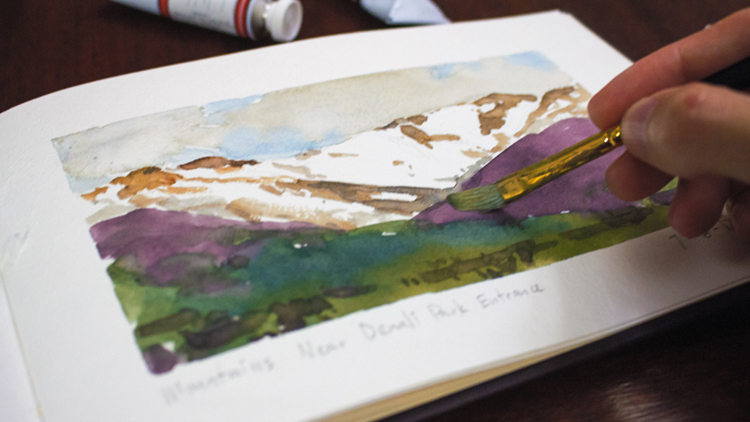 I painted this watercolor from a photograph that I took on a trip to Alaska in early May. This particular scene is of some mountains near the Denali Park Entrance. After many years of wanting to visit Alaska, I finally planned a trip lasting 10-days across several different towns - Anchorage, Denali, Girdwood and Seward being the bulk of the trip. I’ve decided to go with watercolors and sketches for this trip and minimized my materials for ease of use when traveling. I've always thought, 'what's the point of using and lugging around 10+ tubes of color when I can just use a limited palette and mix my own colors from just 3-5 main colors?'. And for the last 5-6 years of my painting career, I have relied heavily on a limited palette of red, yellow & blue to create 95% of my paintings. But things are changing - and I have decided to explore color more deeply in the hopes of creating paintings with stronger color moving forward. This pine tree caught my attention in the early afternoon while riding my bike on the Greenbelt trail in north Davis, CA. I decided to capture the light and tree as best I could.